I have to say this is one of those dish that I'm very proud of. I guess cereal butter prawns is the kind of dish you would pay to enjoy at a restaurant and never imagine that you could do it in your very own kitchen. I just happened to have a can of Nestum All Family Cereal at home. I add it to my hot drink sometimes during tea break, but I was taking so long to finish the can so I thought I use it for cooking too. 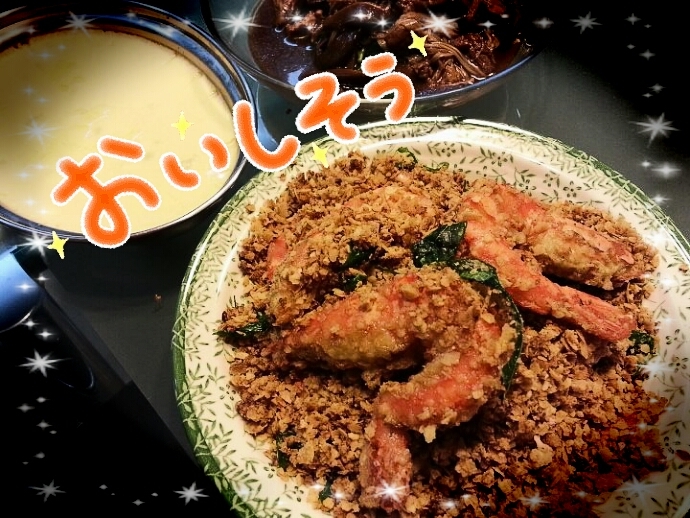 Cereal Butter Prawn was the first (and only) dish I can think of! There are plenty of websites teaching this dish but I chose a YouTube video of the popular "auntie" day time talk show, 黄金年华, cooked by a popular tze char restaurant chef. The recipe was surprisingly simple, and I'm sure anyone can do it at home. 1. Mix (A) together and deep fry in hot oil until the prawns are cooked and golden. Drain and set aside. 2. Using low heat, (B) melt butter in wok and add in chilli and curry leaves. 3. Mix (C) together and stir fry in butter mixture. Stir frying constantly as cereal mix will burn easily. 4. When cereal mix has turned slightly brown, which only takes a minute or two, switch off the fire and reintroduce the prawn to the cereal. Toss the prawns to coat it with the crispy yummy cereal and serve immediately.